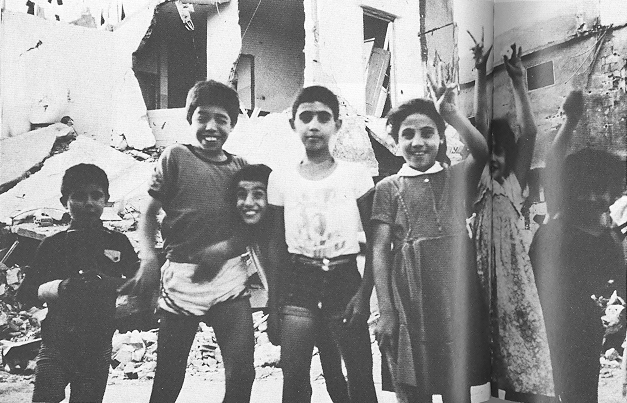 The following extract is taken from Dr Swee Chai Ang’s 1989 book, From Beirut to Jerusalem, which describes the experiences of a British surgeon, herself a refugee from Singapore, who went to help the wounded of Beirut in 1982 after the Israeli invasion and ended up founding Medical Aid for Palestinians (MAP), having witnessed the Sabra and Shatilla massacre of 15-18 September 1982. This extract descibes events and thoughts in the days straight after that massacre of over 3,000 unarmed and undefended women, children and old people by Israeli-backed militias. As I walked through the camp alleys looking at the shattered homes [many of these houses had just been rebuilt following earlier bombardments by Israel] I wanted to cry aloud, but was too exhausted emotionally even to do that. How could little children come back to live in the room where their relatives were tortured and then killed? If the PRCS [Palestine Red Crescent Society] could not function legally, who was going to look after the widows and orphans? Suddenly, someone threw his arms around me. It was Mahmoud, a little child who had broken his wrist while trying to help his father rebuild their broken home. He had survived and his wrist had mended, but now his father was dead. Mahmoud cried, but he was glad I was alive because, from his hiding place during the massacre, he had seen the soldiers taking us away. He thought they had killed me. Soon I was surrounded by a whole lot of children. Kids without homes, without parents, without futures. But they were the children of Sabra and the children of Shatila. One of them spotted my pocket camera, and wanted a picture taken. Then they all stood together, wanting their pictures taken. They wanted me to show their picture to the people of the world. Even if they were killed and the camps were demolished, the world would know that they were the children of Sabra and Shatila, and were not afraid. As I focused my camera, they all held up their hands and made victory signs, right in front of their destroyed homes, where many had been killed. Dear little friends, you taught me what courage and struggle are about. Physical exhaustion comes on and off, but I have no fear, no paranoia: our history has taught us otherwise. Would the slaves of yesterday have ever dreamt that one day they would be free and be called human beings? But this is our testimony – that historical trends are such that we will win. Maybe not today, maybe not tomorrow: maybe not even this generation, maybe not even the next generation – but because we are human we will win, one day. Yes, it will take tenacity, discipline, sacrifice, a great price – but that which rightly belongs to us we will recover some day. Darling, we are just two tiny individuals in this tide of historical liberation. Somewhere we may be washed away, forming the error margin – washed aside – but we know where the tide will flow, and nothing can stop it. It may sound rhetorical – but in the whole history of the oppressed people struggling for justice, nothing will ever sound rhetorical enough. I cry like a young soldier would, one ready and prepared for a battle, but fallen even before the battle has begun. However, I laugh, laugh victoriously, for I know that there are millions that would carry on the struggle after me.